Patriots present Patriots Difference Maker of the Week Award to Mary Jarril from Hudson, N.H.
FOXBOROUGH, Mass. (Nov. 2, 2018) - Eight years ago, the Kraft family and Patriots Foundation introduced Celebrate Volunteerism, a season-long initiative focused on recognizing community volunteers and promoting the importance of giving back to the community through service. Throughout the 2018 season, the foundation will continue its Celebrate Volunteerism initiative by teaming with nonprofit organizations to educate fans about the need for volunteering, highlighting deserving volunteers from across the region and seeking to inspire Patriots fans to become lifelong volunteers. The foundation will present a weekly "Patriots Difference Maker of the Week" award, which recognizes deserving volunteers who go above and beyond to support their New England communities. "We originally started the Celebrate Volunteerism initiative as a tribute to my sweetheart, Myra," said Patriots Chairman and CEO Robert Kraft. "Over the past eight years, it has become the heart and soul of the Patriots Foundation, just like Myra was. We enjoy shining the light on local volunteers that are committed to improving the lives of children and families across the region and we hope that this inspires our fans to get more involved in their communities." Mary Jarril from Hudson, N.H. was selected as this week's Patriots Difference Maker of the Week for her commitment to Habitat for Humanity. "First and foremost, I'd like to thank our Executive Director Scott Slattery for nominating me for this award," said Mary. "I am honored and humbled to receive this award form the Kraft family and the Patriots Foundation." Mary Jarril of Hudson, N.H. was selected as a 2018 Patriots Difference Maker of the Week for her volunteer efforts at Greater Nashua Habitat for Humanity. Mary has been invited to take part in a special in-game ceremony at the Patriots final regular season home game against the New York Jets on Sunday, Dec. 30. For nearly a decade, Mary has been actively volunteering with Greater Nashua Habitat for Humanity. She is a core build crew member that dedicates four to five days a week on the site, building homes for low-to-moderate income families. Mary serves as the materials coordinator for build projects. She speaks with vendors, negotiates pricing, secures donations and consistently advocates for partner families to ensure that they have everything they need to make their house a home. "I came to Habitat as a volunteer to expand my carpentry skills and to be able to give back to the community," said Mary. "After only a few weeks I realized that my vast experience in logistics was desperately needed to help organize equipment and materials. As I learned more about how Habitat operates I started putting in more hours and kicking it into high gear." As a retired Chief Warrant Officer 5 (CW5) from the United States Army, Mary brings a can-do attitude to her volunteer efforts at the Greater Nashua Habitat for Humanity. 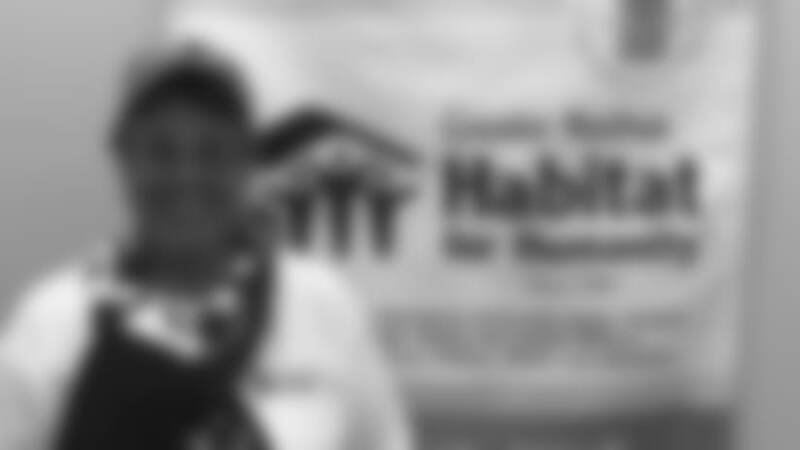 She actively recruits other military members to assist with Habitat projects. She also volunteers at the Habitat ReStore and participates in the critical home repair program, which assists low-to-moderate income families with projects including handicap accessibility, structural and exterior repairs and ensuring there is heat, electricity and safe drinking water. In addition to her volunteer efforts in New Hampshire, Mary has helped to build homes in York, Maine and Hilton Head, South Carolina. She is always willing to go the extra mile and thanks to her dedication, families are able to secure an affordable place that they can call home. "There is nothing more heartwarming than working side by side with the soon to be new home owners as they see their home being built from the ground up," said Mary. "Their faces light up in awe and you want to cry. To all my fellow veterans out there, volunteer whenever you can, for any nonprofit. The return on your invested time will be priceless when you reach out to help those who need it most."